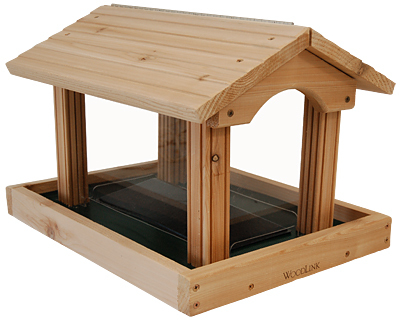 Add a significant feeding station to your bird garden with the Woodlink Professional Cedar Large Hopper Feeder. This beautiful feeder is loaded with features which delight both avian enthusiasts and their feathered friends. Natural cedar lumber forms the base, upright supports, and roof of this unit, with four clear plastic panels creating a seed reservoir. This feeder holds a generous 9.5 quarts of seed, keeping your birds well fed. A cut out section at the bottom of each side panel enables the feed to exit onto the screened bottom. A plastic baffle in the center of the reservoir keeps the seed moving to the ports, preventing buildup, and feed levels are simple to monitor through the clear sides. Each side of the item offers room for birds to dine, and the wooden rim around it keeps seed in place. The green, perforated base allows water to drain from the seed, and the lapped roof protects it from moisture. One side of the roof lifts fully, to easily clean or refill the item. Place a mounting bracket (not included) on the base of this feeder to post mount it. The rot resistant cedar forms a lasting feeder, able to withstand the elements. Keep a generous supply of seed available for your backyard birds in this Professional Cedar Large Hopper Feeder. Made in the USA.